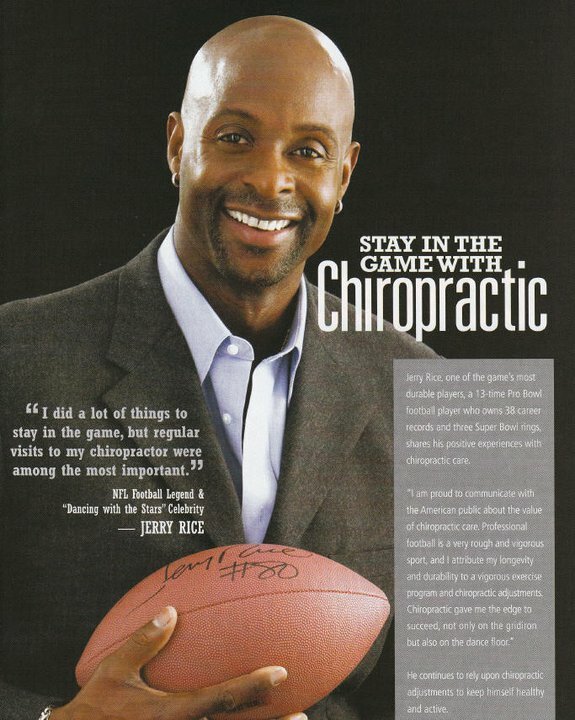 “Chiropractic care has been instrumental in my life, both on and off the field, and I am excited to share this with the American public,” says Rice. A graduate of Mississippi Valley State College, Rice was drafted by the San Francisco 49ers in 1985 where he won three Super Bowl Championships during his 16-year career there. He enjoyed three seasons with the Oakland Raiders, including a Super Bowl appearance and one season with the Seattle Seahawks before retiring in 2005. At his retirement, Rice held career records for receptions (1547), receiving yards (22,895), touchdowns (208) and receiving touchdowns (197) during the regular season; and post-season records for receiving yards (1,848) and receiving touchdowns (22). Rice was rookie of the year for the 1985 season, most valuable player for 1987, Super Bowl most valuable player in 1989, and NFL Player of the Year for 1990 and 1997. He helped the 49ers win three Super Bowls (1989-90,1995).